View of Molokini from Maui. Three miles off the coast of Maui’s lies Molokini, one of the most popular islets in Hawaii. 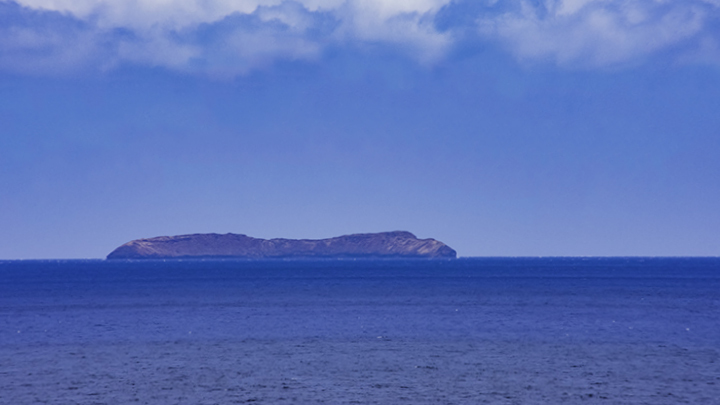 You can find this small volcanic island in the Alalakeiki Channel between Maui and Kaho’olawe. Appearing almost unreal in its blue surroundings, this islet spans nearly 23 acres rising 160 feet above sea level. Here’s how you can visit Molokini and what you will find there. A volcano created Molokini over 230,000 years ago. Researchers have found many archaic fishing tools on Molokini. This proves that ancient Hawaiians would often visit Molokini, most probably as a fishing spot. Here, they would have access to eggs from nesting sea birds. It was also a good place to gather bird plumage for use in adornments and decorations. Today, Molokini is one of the most beautiful snorkeling locations in Hawaii. It’s also a prime spot for scuba as well as for snuba, a diving system bridging the gap between snorkeling and scuba. Its crescent shape and undersea crater create a natural protection from strong currents and heavy waves. And as a result, it offers calm and clear waters for diving. For those diving deeper, there are 350 feet deep caverns and coral reefs of astounding clarity down to 150 feet. Locals and tourists alike flock to its still waters that teem with vibrant reef fish. You can dive the back side of Molokini to see whitetip reef sharks, moray eels, dolphins and octopi. Molokini is also a great location for whale watching. The underwater crater is close to some of the busiest whale migratory paths. Visitors have regularly spotted humpback whales on boat tours around Molokini. The island is also home to the Hawaii State Seabird Sanctuary. Here, seabirds, such as the Bulwer’s petrels and wedge-tailed shearwaters, come to nest. The 77 acre expanse surrounding Molokini is also a Marine Life Conservation District. This area hosts 250 species of reef fish. They include: the kikakapu (raccoon butterflyfish), uhu (parrot fish), omilu (bluefin trevally), kihiki (Moorish idol), lau’i pala (yellow tang) and the humuhumu’ele’ele (black triggerfish). Some visitors have even captured images of the rare whale shark. It is a gentle plankton eating creature posing no threat to humans. Because of the frequency of boat traffic to Molokini, the fish here are well accustomed to humans. As a result, they are not as skittish as in other snorkeling locations. In order to land on Molokini, visitors must first receive permission from the Coast Guard as well as the State. Regulations prohibit fishing, feeding wildlife or removing any natural resources here. Boats cannot drop anchor into the bay as this could damage fragile coral reefs. Despite the restrictions, visitors who enjoy snorkeling or scuba diving, should certainly add Molokini to their itinerary.